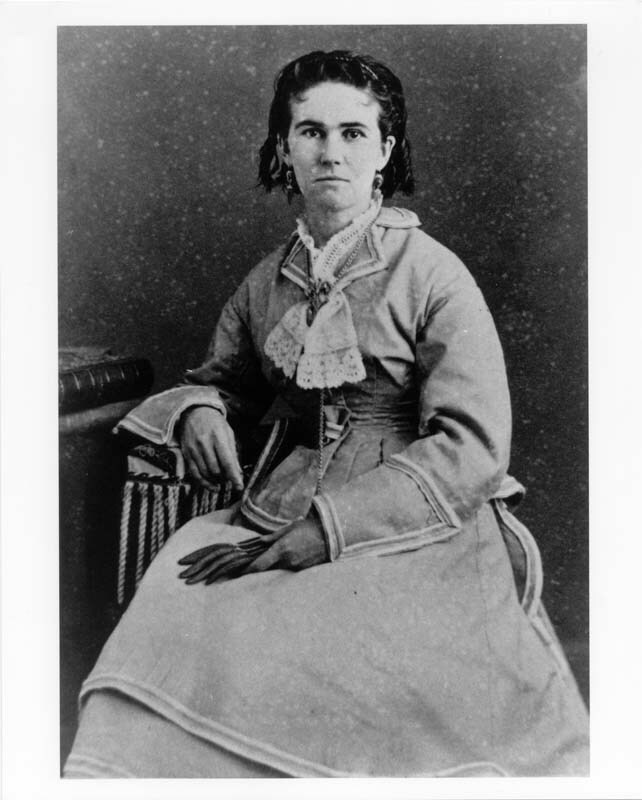 Lizzie E. Johnson Williams. Image available on the Internet and included in accordance with Title 17 U.S.C. Section 107. WILLIAMS, ELIZABETH ELLEN JOHNSON [LIZZIE] (1840–1924). Lizzie E. Johnson Williams, schoolteacher, cattle dealer, and investor, was born on May 9, 1840, in Cole County, Missouri, the second of the seven children of Thomas Jefferson and Catharine (Hyde) Johnson. About 1844 her family moved to Texas; they lived in Huntsville, Lockhart, and Webberville, where Thomas Johnson taught school, before settling on Bear Creek in Hays County. Lizzie received her basic education at the Johnson Institute and earned a degree in 1859 from the Chappell Hill Female College in Washington County. She began her career as a schoolteacher at the Johnson Institute, a private coeducational school founded in 1852 in Hays County by her parents. Before establishing her own primary school in Austin, she taught at Lockhart, Pleasant Hill School (at that time south of Austin), Parson's Seminary in Manor, and Oak Grove Academy in Austin. In 1873 she purchased a lot in Austin, where she later resided in a two-story home and conducted classes on the first floor. She later kept books for cattlemen and invested in cattle and land. She was teaching in Austin as late as 1880. Through her bookkeeping and her acquaintance with prominent cattlemen and investors of the day, including George W. Littlefield, William H. Day, and Charles W. Whitis, she recognized the profits to be made in cattle. On June 1, 1871, she registered her cattle brand under the name of Elizabeth Johnson. Two days later she made her first real-estate transaction by purchasing ten acres of land in Austin from Whitis for 3,000 gold dollars. She achieved legendary status as an early Texas "cattle queen" and is thought to be the first woman in Texas to ride the Chisholm Trail with a herd of cattle that she had acquired under her own brand. Before her marriage to Hezekiah G. Williams on June 8, 1879, the couple signed a premarital contract allowing her to retain control of her financial affairs and keep her property separate. Although much of the land she eventually acquired was originally owned by her husband, she was thought to have been the controlling influence in his business dealings. She presumably assisted her husband in his attempt to take the county seat away from San Marcos after the Hays County Courthouse burned in 1908. The couple built a town called Hays City on their ranch in Hays County, but their colonization scheme failed and the town ceased to exist. Hezekiah ostensibly conveyed all of his property to Lizzie on July 30, 1896, but the document he had signed was not officially recorded and filed until seventeen years later, when he was in poor health. After her husband's death in 1914, Lizzie grew increasingly reclusive and eccentric. She also had a reputation for being miserly. Because she sometimes appeared to be impoverished, Austinites were startled to learn after her death that Lizzie Williams had amassed almost a quarter of a million dollars. Her holdings included property in Travis, Llano, Hays, Trinity, Culberson, and Jeff Davis counties. She died on October 9, 1924, and is buried in Oakwood Cemetery in Austin. Ann Fears Crawford and Crystal Sasse Ragsdale, Women in Texas (Burnet, Texas: Eakin Press, 1982). Frances Stovall et al., Clear Springs and Limestone Ledges: A History of San Marcos and Hays County (San Marcos: Hays County Historical Commission, 1986). Vertical Files, Dolph Briscoe Center for American History, University of Texas at Austin (Lizzie E. Johnson). Handbook of Texas Online, Roberta S. Duncan, "WILLIAMS, ELIZABETH ELLEN JOHNSON [LIZZIE]," accessed April 25, 2019, http://www.tshaonline.org/handbook/online/articles/fwixg.